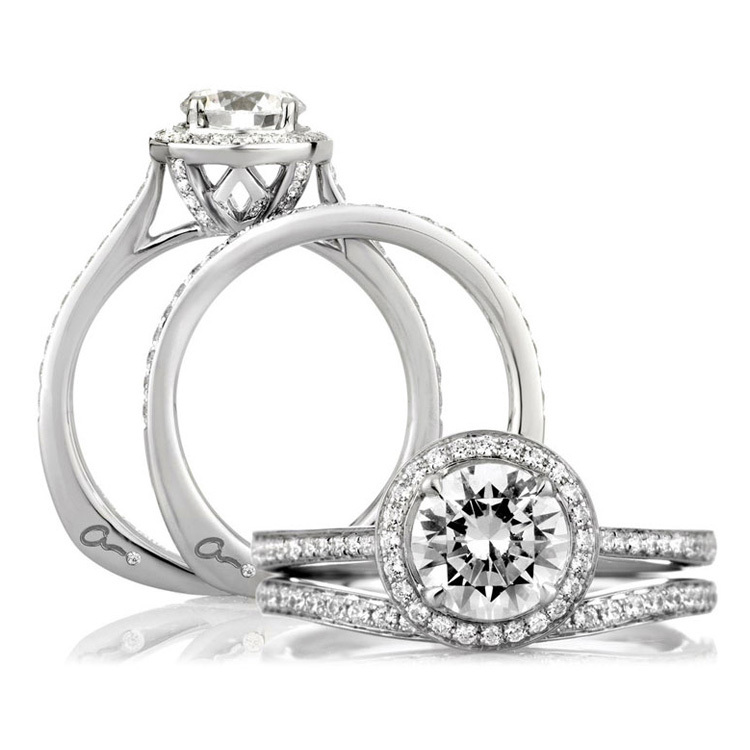 A Jaffe Engagement Rings created with Passion since 1892! 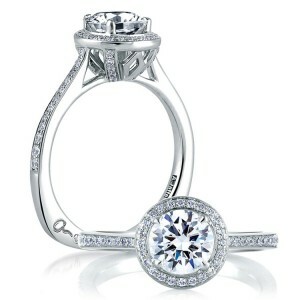 Romantic Pave Set Halo Engagement Ring. For over 100 years, the designers, model makers, casters, jewelers, setters, and polishers employed by A Jaffe have been recognized for the quality of their work. A Jaffe jewelry is designed and finished with pride, in America. Signature Collection with Euro Shank. Enjoy the superb comfort of A Jaffe's Euro shank (square bottom) - this brilliant design contributes to keeping your ring setting upright and preventing it from turning on your finger - your ring stays at it's peak presentation so you'll always look great! 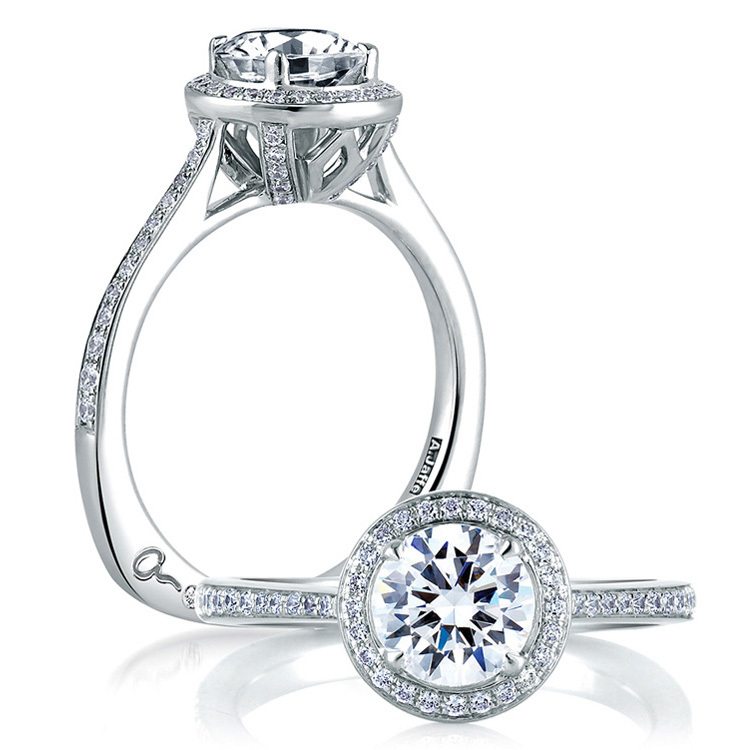 A halo of pave set diamonds embrace the center stone of this classic engagement ring. Pave diamonds cascade down the shank and accent the basket of the ring making it a unique twist on a classic. metal selection (platinum, 18 Karat or 14 Karat) and variation of design. For a fabulous Center Diamond, or a Triple 000, the highest light performing diamonds on record, call TQ Diamond's expert staff at 608-833-4500. 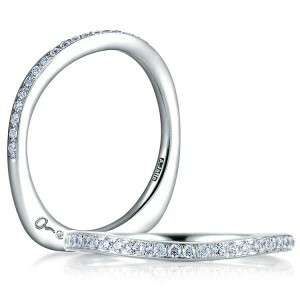 We can create your custom ring, using different size diamonds, to fit your budget in each A Jaffe ring! A Jaffe rings in stock, ship within 24 hours. Since A Jaffe ring mountings are custom made to fit the center diamond, and finger size, it may be necessary for us to place a custom order with A Jaffe. As an authorized A Jaffe retailer, our orders are usually filled first. Please allow 3-4 weeks for delivery. When you purchase an A Jaffe from TQ Diamonds, your decision is more than an investment in a beautiful piece of jewelry - it is also an investment in the lifetime care of the piece by the expert artisans at A Jaffe and TQ Diamonds! What does the A Jaffe Warranty Cover? Can I buy directly from A Jaffe? A Jaffe does not sell directly to the public. A Jaffe is a designer and manufacturer of rings, fine jewelry and accessories. All of our jewelry is distributed to the public exclusively through authorized A Jaffe Retailers. 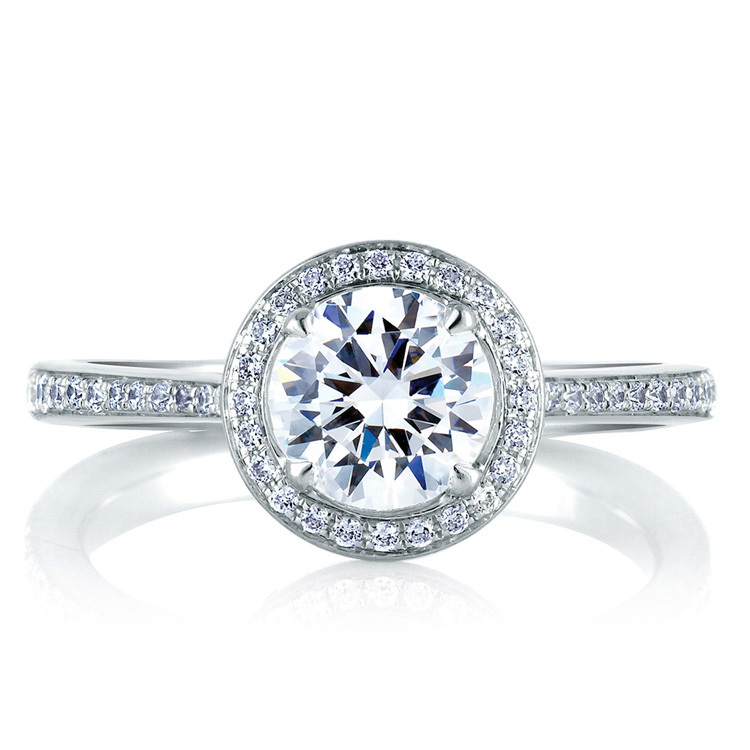 TQ Diamonds is a premier authorized retailer, who is more than happy to assist you with sales, pricing and service. What is an Authorized A Jaffe Retailer? TQ Diamonds, as an authorized A Jaffe Retailer is a reputable and well-established jewelry store that carries the A Jaffe collections! TQ Diamonds has exclusive rights to represent and sell our jewelry. 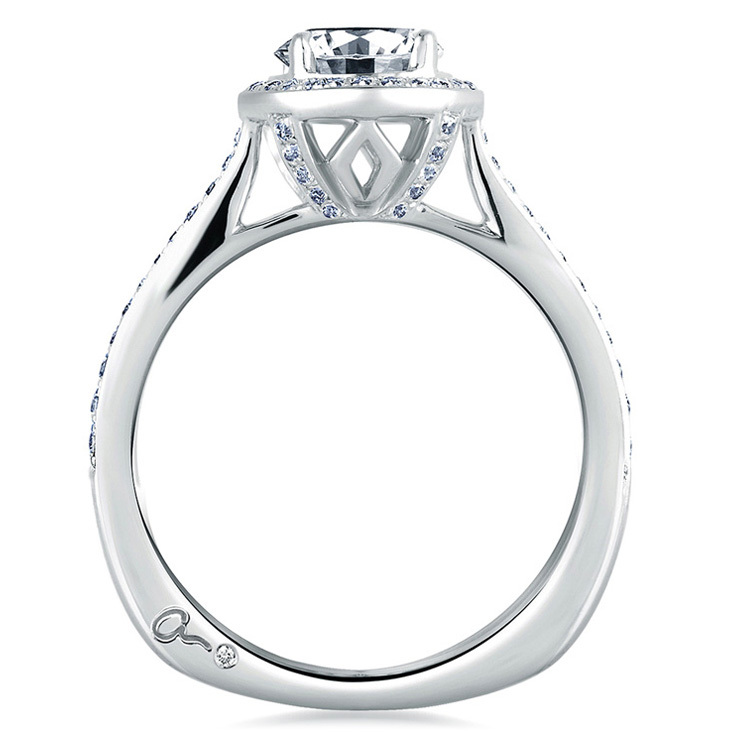 A Jaffe has personally chosen TQ Diamonds because they have the experience and expertise to properly represent A Jaffe and provide you with the best service available. Don't risk losing your A Jaffe warranty! Look for the trademarked "A with a diamond in the tail" on your ring, this signature design ensures you have an authentic A Jaffe. Your warranty is void if your A Jaffe was purchased from an online auction site or has been damaged by unauthorized service, negligence or accident, or other causes not relating to defective material or workmanship. Don't risk losing your warranty buying an A Jaffe from an online auction site that can't offer a valid warranty! TQ Diamonds is your #1 authorized dealer.